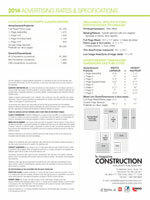 Click on the image to the left to download a copy of the 2014 Mechanical Specifications. 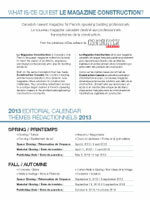 Click on the image to the left to download a copy of the 2014 Editorial Calendar. Please Note: To view the Media Planner, Mechanical Specifications or Editorial Calendar, you will require the FREE Adobe PDF Reader software. Accueil | Planificateur média | Politique de confidentialité | Contactez-nous Copyright ©2019 Kenilworth Publishing Inc. Tous droits réservés.